Justin Simien’s Dear White People is a satirical look at a fictional Ivy League college, Winchester University, through the eyes of four black students. Racial issues reach a boiling point after a racially themed party takes place on campus. The film centers on the events leading up to the party and how the four main characters deal with it. Dear White People’s strength is in its main characters – there’s Sam White (Tessa Thompson), a militant radio host on campus who has a show titled “Dear White People”; Lionel (Everybody Hates Chris’ Tyler James Williams), a writer for the school paper who doesn’t quite fit in with the black students or white students; Troy (Brandon P Bell), a golden boy and son of the university’s dean; and Colandrea ‘CoCo’ Conners (Teyonah Parris), a vlogger who has dreams of being a reality TV star. The performances in this film left me with three thoughts 1) There is great young talent in Hollywood not being used. 2) I can’t believe Justin Simien is a debut writer and director 3) We rarely see female characters this flushed out in film, especially when they’re women of color. Simien did a great job writing his characters as well rounded people. They are characterizations, stereotypes, or one dimensional. He reminds us what we were like at that age. How much about the world we thought we knew and how much we really didn’t know. This is evident in Teyonah Parris’ character CoCo. She’s trying to find her place in life. What is that place? Where does she fit in? She doesn’tknow, but the film takes us on a portion of her journey in self discovery. Tessa Thompson steals the movie as the campus radio host and one of the linchpins that leads to the big showdown at the campus party. She plays Sam with an equal amount of strength and vulnerability – she’s as beautiful as she is strong. There’s a great scene when she’s asked about her paper on Gremlin’s being about suburban white’s fear of black culture. Her response: “The gremlins use loud talking slang, are addicted to fried chicken, and freak out when you get their hair wet”. It’s impossible to take your eyes of Thompson when she’s on screen.She displays the confidence of a seasoned actress. It’s not just that she’s a skillful actress. Whatever ‘it’ is that gives someone great presence in front of the camera, she has ‘it’. Thompson has put herself on the list for young talented actresses and looks to open more eyes this winter in Selma. Simien does a good job of using humor to show people what it’s like to be the only black person amongst a sea of white faces. If you’ve ever been the only black person at school, work, at a party, or weekly press screenings, that satire isn’t lost on you. Humor drives the satiric dialogue in the film, but Simien peels back enough layers to show the frustration and irritation that exist in those situations. Towards the end of the film it steers away from the satirical approach and becomes a film about what it’s like navigating racial differences in a large social group, and how people deal with offensive racial stereotypes. This points to the broader point in the film – How far have we come, or not come, dealing with racial issues in this country. Don’t let the serious tone of the film’s description fool you, it’s funny. It’s more fun and funny than it is serious. There’s enough one-liners and hilarious situations to earn the comedy tag attached to this film. This film couldn’t come out at a better time since October is unofficially College Students in Inappropriate Blackface Month. This is easily one of the best debut films in years. Audiences will be able to laugh at the terrible things people say and do without losing the seriousness of the racial problems in society. 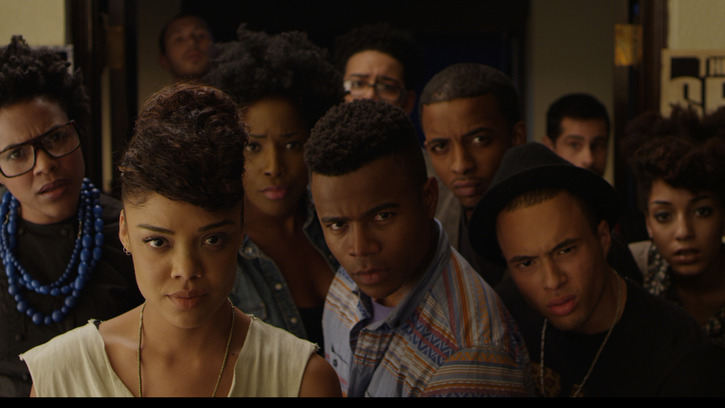 Dear White People reminds us, sometimes you have to laugh to keep from crying. Posted in Reviews and tagged Brandon P Bell, comedy, Dear White People, Grade: B, Gremlins, Justin Simien, Selma, Tessa Thompson, Teyonah Parris, Tyler James Williams. Bookmark the permalink.